3 out of 3 indicators were rated as PASS. for the bay to be rated as PASS. The overall health of Blackburn Bay deteriorated slightly in 2015. Chlorophyll a increased significantly, particularly in the latter half of the year, with the mean value increasing 79% over 2014. Nitrogen concentration decreased slightly, remaining in the “Good” range, between target and threshold levels. The mean value for phosphorus concentration increased only very slightly, and is still well below the target. Water Quality: While all three water quality indicators (chlorophyll a, nitrogen, and phosphorus) were rated as pass, chlorophyll a's rating changed from “Excellent” to “Good” because of its large increase in value. The mean for chlorophyll a was calculated as an arithmetic mean and the means for nitrogen and phosphorus were calculated as geometric means (per the Numeric Nutrient Criteria outlined in the Florida Administrative Code, section 62-302.532). The mean chlorophyll a level was 0.0077 mg/l . The mean nitrogen level decreased from 0.4226 mg/l to 0.4059 mg/l. Phosphorus concentrations in the bay have remained relatively constant and low, with a mean in 2015 of 0.0702 mg/l, well below the target (0.170 mg/l) and threshold (0.210 mg/l) levels and earning a score of “Excellent”. Biotic Indicator: Measurement of the biotic indicator, seagrass, was performed in 2014 by the Southwest Florida Water Management District. 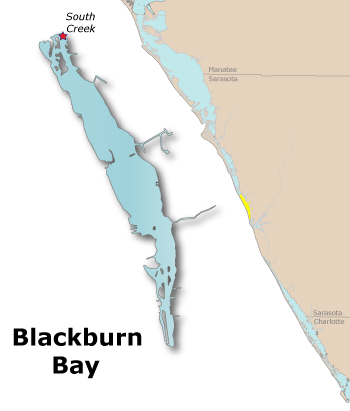 Total seagrass acreage in Blackburn Bay was measured to be 344 acres. Seagrass acreage continues to slowly increase, but it is still below the target level of 447 acres. The Five-year Trend Graphs below illustrate the general trend of water quality parameters. They show a six-month running average, which moderates high and low values in the data. Score: Good How was this determined? The rating for Chlorophyll a is determined by comparing the annual arithmetic mean of its sampled values to fixed target and threshold values. The annual arithmetic mean is shown in the graph at left, as compared to its established target and threshold values. An arithmetic mean is used for Chlorophyll a for consistency with the Surface Water Quality Standards, Florida Administrative Code 62-302.532, Estuary-Specific Numeric Interpretations of the Narrative Nutrient Criterion. The rating for Total Nitrogen is determined by comparing the annual geometric mean of its sampled values to target and threshold values. The target and threshold values are variable for Sarasota Bay, established annually, while they are fixed for the other bays. The geometric mean is found by multiplying together all the sample values for the calendar year and then taking the nth root of the result, where n is the number of samples. The annual geometric mean for Total Nitrogen is shown in the graph at left, as compared to its established target and threshold values. A geometric mean is less affected by data anomalies, dampening the influence of very high or very low sample values. A geometric mean is used for Total Nitrogen for consistency with the Surface Water Quality Standards, Florida Administrative Code 62-302.532, Estuary-Specific Numeric Interpretations of the Narrative Nutrient Criterion. Score: Excellent How was this determined? The rating for Total Phosphorus is determined by comparing the annual geometric mean of its sampled values to fixed target and threshold values. The geometric mean is found by multiplying together all the sample values for the calendar year and then taking the nth root of the result, where n is the number of samples. The annual geometric mean for Total Phosphorus is shown in the graph at left, as compared to its established target and threshold values. A geometric mean is less affected by data anomalies, dampening the influence of very high or very low sample values. A geometric mean is used for Total Phosphorus for consistency with the Surface Water Quality Standards, Florida Administrative Code 62-302.532, Estuary-Specific Numeric Interpretations of the Narrative Nutrient Criterion. In addition to nutrient levels and chlorophyll concentration, dissolved oxygen levels, and water clarity are also objective indicators of bay health. These have complex interactive cycles which are affected by rainfall, temperature, and tidal action, as well as other factors. High nutrient levels (nitrogen and phosphorus) can stimulate excessive growth of marine algae (indicated by chlorophyll a level), resulting in reduced water clarity (and increased light attenuation) and depleted oxygen levels. Both plants and animals in a bay need oxygen to survive, and the seagrasses which provide food and cover for bay creatures need light for photosynthesis. Visit the Water Quality Contour Mapping Tool to view and compare monthly water quality contour maps for ten different water quality indicators. In addition, you can generate your own custom maps.